Australian Government returns Asylum Seekers to the country they are fleeing! These asylum seekers included woman and children, and there are already reports coming out that some of those asylum seekers have suffered injuries and inhumane treatment since they were handed over to the Sri Lankan navy. The asylum seekers were turned over to the Sri Lankan navy without any real assessment of their claims. They did not have access to any legal representation, they were not given the opportunity to have their cases independently reviewed, and they were unable to appeal. The government is currently holding other asylum seekers on the high seas, subject to a High Court injunction while their lawyers challenge whether the government has the legal power to hand over asylum seekers at sea. The Australian legal community, including lawyers and academics specialising in immigration, refugee and human rights law, as well as the Australian Human Rights Commission, have repeatedly raised concerns that the Australian Government’s actions violate international law and the human rights of asylum seekers. It is a fundamental principle of international human rights and refugee law that asylum seekers must not be returned to their country of origin without a fair and robust assessment of their claims. In order to abide by the rule of law and comply with international law, the Australian Government must allow asylum seekers to put their claims to be assessed by an independent and impartial tribunal, with full access to legal representation and appropriate avenues of appeal. The fact is that if these asylum seekers are genuine, then returning them to the exact country that they are risking life and limb to escape can only end badly. Australia’s international reputation took a severe hammering during the Howard administration when the Tampo crisis hit international news. This recent “approach” has attracted more justified and more severe international condemnation. 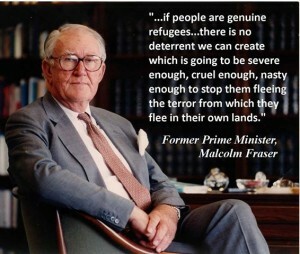 Apparently our current government disagrees, despite the overwhelming international condemnation of this inhumane approach to refugees.